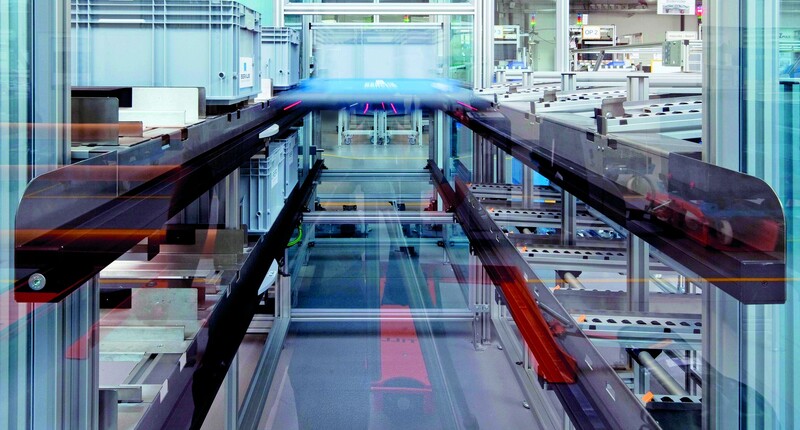 Modern material flow technologies can both support process-oriented structures and revolutionize intralogistics using newer and more efficient processes. For example, the “injection principle” involves delivering small volumes of the material directly to the target location using an autonomous transport robot. This reduces the handling process, accelerates the material flow, keeps routes short, and also saves outlay on expensive production and storage areas. The factory planning competence center integrates the “injection principle” into the factory layout design in order to support medium-sized manufacturing companies and open up additional space without new building. Production area with local supermarket shelves on individual machines. Legacy: Production area with local supermarket shelves on individual machines. 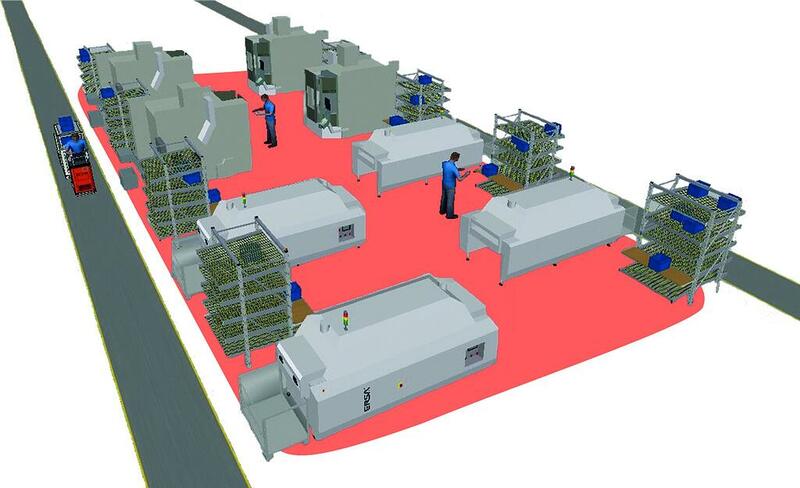 A typical production area planned according to lean criteria, mostly consists of local “supermarkets”, which take the form of continuous flow racks on individual machines: Figure 1. The machine operator takes the parts off the supermarket shelf, on which all the parts required for the respective production step are available. The empty containers are then put back on the shelf and slide outwards. This solution takes up a comparatively large amount of space for the supermarket shelves and thus necessitates long routes in multiple machine operation. Additionally, a large amount of space is necessary for the paths and stops. In contrast to this, the basic idea of the injection principle is not to supply material from the outside on a large scale, but instead to “inject” it in small quantities into the production area as closely as possible to the machine location. Put into practice, this mean provisioning material from the top directly to the necessary location – right into the center of the path- optimized multiple machine layout. The material flow direction is thus reversed. Material provisioning takes place internally as opposed to externally, and the material then flows from the inside outwards. Following the injection principle, conveying relies on state-of-the-art material flow technology routed along the hall ceiling. On the ground, only the delivery point in the form of a container lift is required. As a result, the machines can be located closer to each other. Due to the speed and the responsiveness of the system, the supermarket shelves are omitted. Empty containers are returned to the system and transported to the empties station via the container lift. Viable with innovative technology: Injection principle with material output in the middle of the machines. Figure 2 visualizes the injection principle approach. 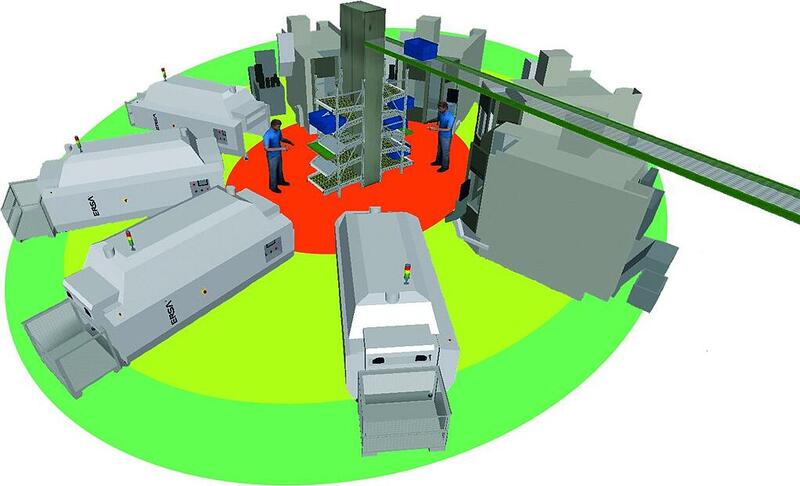 Material is provisioned for the machine operator via the output tower at the center; the operator feeds the machine. Compared to a conventional solution, the worker area can be kept smaller because the employees no longer have to fetch the material from the edge of their area. This makes it is possible to achieve shorter routes and trouble-free multiple machine operation. The worker only has to enter the machine area in the event of a fault, for change-over procedures or similar events. It is only occasionally that tasks, for example, changing a container for finished products, have to be carried out in the finished component area (green area). Paths can be reduced by more than 50%. Innovative transport robots, which act as local “swarm robots” are the enablers of the injection principle. This means that, for example, all internal logistic processes – from incoming goods, through the warehouse, office, production, assembly, picking, to outgoing goods – are integrated into an efficient, seamless flow process. One example of such innovative transport robots is the “intelligent” and autonomous “Servus ARC3” (Autonomous Robotic Carrier 3) transport robot. Individually configured for size, performance or load handling attachment, it can transport numerous products and materials. They range from simple cardboard boxes, boxes and trays to bulk goods or customer-specific workpieces of up to 50kg. Equipped with state-of-the-art technologies – such as ABS (anti-blocking system), ESP (electronic stability system), ASR (traction control) and energy management with energy recovery – the ARC is a reliable, low-maintenance product. The load handling attachments integrated into the ARC allow for independent loading and unloading on the left or right along the route. The autonomous robot receives its orders from the control center (directly connected to the customer software) via high-frequency wireless technology; it handles the tasks independently, always taking the shortest route. Thanks to modular components, the system can be flexibly tailored to customer needs from a modular assembly kit with bearing and track components, thus saving space for the customer. 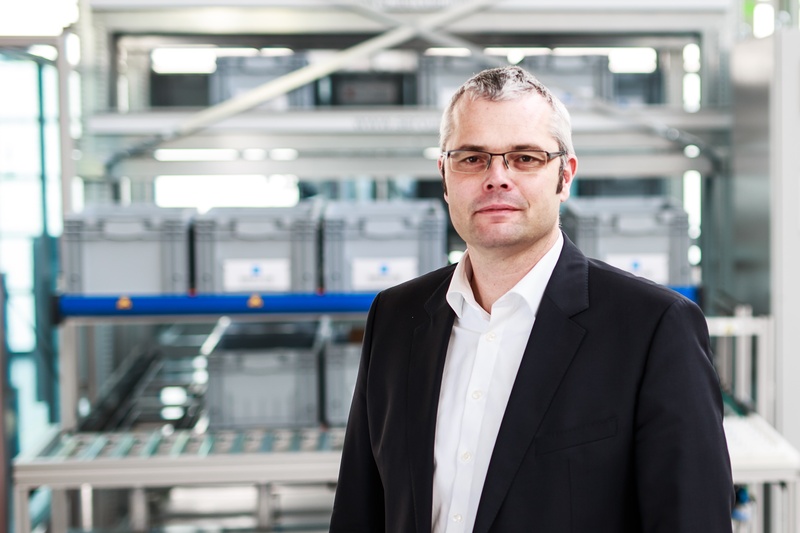 Markus Schneider is an associate professor at the Landshut University of Applied Sciences and the head of Technology Centre for Production and Logistics Systems (TZ PULS) in Dingolfing.